Nothing too fancy, wanted something relatively neutral and medium-dark so the sandstone rubble would pop, and hopefully set off the crimson and gold of the models nicely. I'm thinking some tufts of dried grass may work well to give them just a little more visual interest - I think I'd better off avoiding my usual green mix though, want to keep an arid feel going for them. The bases are from Elrik's Hobbies - Link to the Egyptian Ruins bases! In other exciting news, I got a little box of joy from Chessex from whom I'd ordered a mess of custom dice - Five different sets of 20, each bearing the crest of one the five cults of the Thousand Sons on the 6 face of the die. 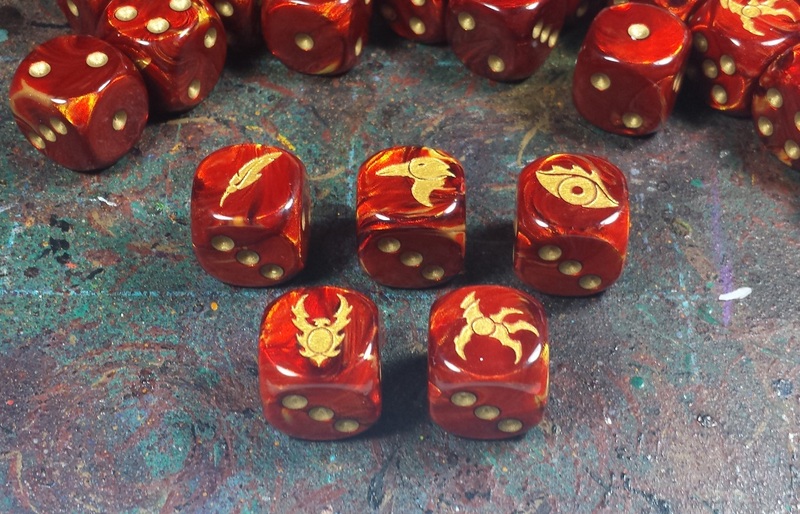 As I don't REALLY need 100 dice, I'm planning on bundling them up and handing them out to any fellow Thousand Sons players I come across at NOVA later on this year! Nice bases and giving out the extra dice to other 1k sons players, cool idea! Oh you tease! Showing just bases! I like the ruins with the ruins on them. How/where did you get them? Anothet reason to curse all these conventions that are on the wrong side of the Atlantic. You need a house rule that lets warp charges ebb and flow based on the discipline showing on the dice! That would be really fun. The bases are looking awesome..
@Col. Hertford: Thanks! I was really happy with the work Chessex did! @Rory Priest: Hah! That's all there is to show so far, the tidal wave of crimson and gold will begin soon though! 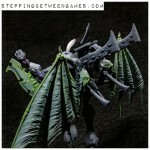 The bases are from Elrik's Hobbies, I'll append the post with the link. @Todd Sherman: I was really impressed. I shot them a jpg, described what I wanted, and one of their production folks woked with me via email to get it all sorted out. Couple weeks from when I first emailed to having 'em in hand, at about $1 a die. Well pleased! ohh those dice man. Those Dice. Good shout on the bases. @Chris John: Thanks! Chessex really knocked it out of the park on the dice, couldn't be more pleased with the result! The bases look great - I think the tufts added would be good, but not too many as I'm liking the simple take thus far. There'll be no 1K Sons players like you. You're the only fool who followed that one-eye'd moron into the embrace of the Lord of Change.